Most Homes Waste Over $1000 a Year Through Energy Loss. The average home should experience a complete air change every couple of hours. In other words, all of the air in the home should be replaced with new, fresh air in this time. In most homes, this occurs more often due to low insulation levels, which causes your heating and cooling systems to work harder, resulting in you paying higher energy bills each month. 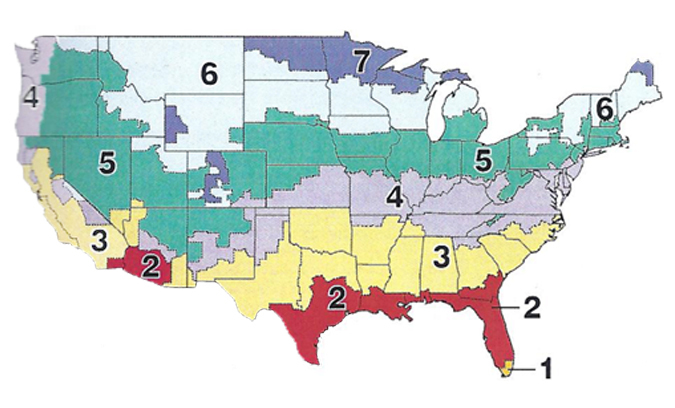 Did you know that most homes across the country are under insulated? Most homes built before 1990's have little or no insulation in them at all. Many new homes that are built today are only insulated to meet the bare minimum code requirements which are usually not even close to near the government recommendations. The map below provides you with a recommended R value for homes across the country depending on climate type as well as heating type (oil, gas, or electric.) 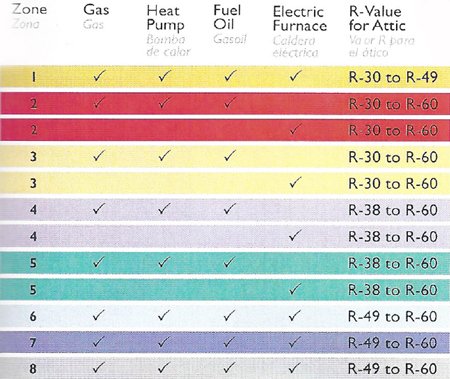 You can find your home's location on the map and refer to the color and zone coded chart below to determine the government recommended R-Value for your specific location. Can I afford attic insulation at this time? Yes you absolutely can!! You really cannot afford not to do it . Not only are you saving money on energy costs but there are many local state and federal rebates available to you. Click on the links below to find out what rebates/credits are available in your area! Quality Construction also has many financing options that can often times make your monthly bill lower than your monthly savings. Give us a call for details!! Here at Quality Construction we are always looking at ways to save energy and save our customers money in the process. Our machines can handle anything from small home attics to commercial insulation interests. We also have the capability to blow in fiberglass insulation as well as cellulose insulation. If you are considering insulation for your home or business feel free to give us a call or fill out the contact form at the top right of the page.